In April 1770, Lieutenant James Cook sailed his ship HM Bark Endeavour along the South Coast of New South Wales. A few days before entering Botany Bay, Cook sailed past Jervis Bay. As he did, he named the northern headland of the bay Point Perpendicular. As soon as you see the headland you can see why Cook named it (Cook gave many similar names to locations, simple they may have been but practical they certainly were for the following explorers). I have taken guests from overseas to Jervis Bay and the one thing they all have commented on is the amazing cliffs that run from Point Perpendicular right along the coast to the Drum and Drumsticks. These cliffs drop more than a hundred metres from the cliff top to the sea with no rock platform. Below the surface, the scene is just as dramatic. Point Perpendicular is no different. There are four or five separate dive sites along Point Perpendicular. Unfortunately, the names of these sites are sometimes quite confusing, with different dive operations and the only book on Jervis Bay diving using different names for the same sites or the same names for different sites. Such is the case with this dive site. Sometimes known as Pyramid Rock (by Ocean Trek) and Sponge Gardens (Sea Sports), I prefer Sponge Gardens as there is another Pyramid Rock further to the west (Sea Sports) and one on south-eastern Bowen Island (Tom Byron's book - the real one as far as I am concerned). 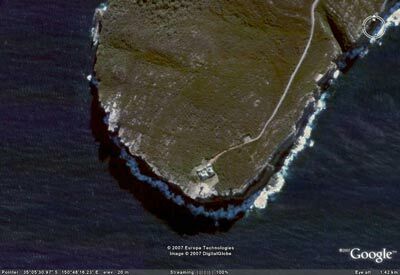 Anyway, this location is found by lining up on the huge pyramid shaped rock found about half way along Point Perpendicular and running in towards the shore. When the reef is encountered, drop anchor once the depth has come up to 25 metres. The depth on the sand is 34 metres or so. Once on the bottom, drop down to the sand edge. In this area there are huge boulders covered in sponges and sea squirts. In between there are some smaller rocks, similarly covered. There is not a great deal of fishlife in this area, but you will see a lot of black reef leatherjackets, some wobbegongs and in early winter, Port Jackson sharks. 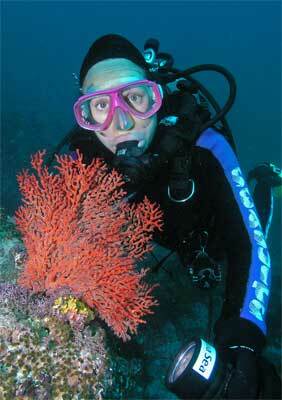 The best attractions deeper are the sponges, sea squirts, gorgonias and other colourful fixed marine life. After five or so metres, start to ascend the reef in a northerly direction. You will find some nice gullies/swim-throughs and the rocks change from being covered in sponges to being quite bare. Once you get into the 12 metre range you will find some excellent swim-thoughs and a couple of very large caves. Some of these are shallower in the five to seven metres area. These are created by huge rocks balanced on other rocks rather than cracks in the main rock platform or cliffs. In this area the fishlife is quite prolific, with huge schools of yellowtail, seapike, ladder-finned pomfret and other fish. You may also see some firefish and most times giant cuttlefish. This is an excellent dive location, with heaps to satisfy any diver, no matter their experience.